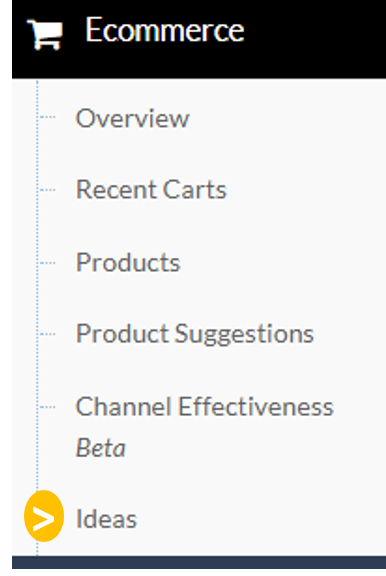 From the left side menu options, select Ecommerce > Ideas. In the dashboard, you can choose from a number of ready-made scenarios based on the email marketing strategy you want to implement. In this article, we will briefly present these scenarios, describe the logic behind and what are the events that trigger the automations. This is probably the most important automated scenario in the context of e-commerce. It's a reminder to customers that have added a product to their shopping cart but didn't proceed to a purchase. The trigger event, in this case, is when the user adds a product in the cart. Then you can set a time delay of minutes or hours (even days) before sending the Cart abandonment email. The Cart abandonment email (which you will create through the Editor) will contain the product or products that this specific user has added to the cart. ContactPigeon's Cart abandonment is triggered even when the user is not logged in to the site (assuming that is known contact of course). As a result, the number of triggered emails is increased compared to a "traditional" recovery email generated from the e-commerce platform. Eventually, more cart abandonment emails will have as a result increased sales. For optimal conversion outcome, this reminder in pre-built ideas will be automatically delivered 2 hours after visitors left your eCommerce store with unpurchased items in their shopping cart. This is a similar concept to Cart abandonment but it goes one step earlier in the purchase consideration process. It's an email that suggests products that the client has seen at least N time(s) in discrete days and he/she has not added the products to the cart. By activating this automation you increase the total amount of sent triggered emails (and hopefully the total sales) simply because users tend to browse more to web pages rather than adding products to their carts. In the pre-built ideas, the email reminder will be automatically delivered 5 days after a visitor abandons a browsing session. This automation is a sales generator in industries where customers buy periodically the same products. Industries like e-groceries, e-pharmacies, pet shops to name a few. You can identify these purchases and the time that usually the re-buy takes place (i.e. 30 days, 2 months etc.) and create reminding email campaigns. With a re-buy reminder, you can send a different email to each customer and suggest him/her to buy again products that the rebuy date is overdue by N days. This is a discount-oriented version of the browse abandonment email. When the price for a product drops, ContactPigeon algorithm triggers emails to visitors who previously browsed this specific product. When you have a broad product portfolio with thousands of products, it's sometimes impossible to create newsletters where you will communicate your price discounts (and this may be harmful to your brand equity as customers may perceive your brand as a discount-oriented). With this automation, you'll send an email only to users that have shown interest in a specific product, thus increasing the possibilities for an actual conversion. This pre-built reminder will be automatically sent as the price is dropped in the product catalog to all visitors who have browsed the product within the last 3 months. If a customer has shown an affinity for a brand or a category of products, wouldn't they like to know when a new product has been introduced? If you're into retail business you will find it very useful to have some standard automated emails with new products from your product portfolio. For example, you can separate Men and Women collections and send triggered emails to male and female users respectively. Or dog's food and cat's food in case of pet-shops. The combinations are quite endless in this kind of automation, so you can find what fits your business. This reminder will be automatically delivered 4 hours after a new product enters catalog, to those customers who have an affinity for browsing or purchasing the specific product category. Customer journey doesn't end at purchase. You can re-engage customers with a post-purchase email where you can both thank them for their last purchase and also suggest customers relevant products or give them a discount on the next purchase. Also, you can send surveys to measure customer happiness and ask for product reviews that can be used further in your marketing strategies. This reminder will be automatically delivered 7 days after purchase to give the customer a chance to fully enjoy the products before soliciting a review. 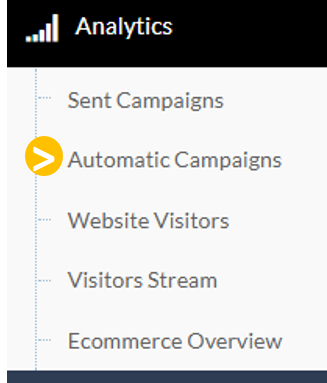 In ContactPigeon platform you have a comprehensible dashboard where you can see in-depth analytics for all your active automatic campaigns.